Dr Ephraim Kisangani with Meghan, Duchess of Sussex at the Reception in LondonMeghan, Duchess of Sussex showed particular interest in the work of Bangor University Masters student Dr Ephraim Kisangala, a Commonwealth Scholarship student from Uganda, who she met at a London reception recently. 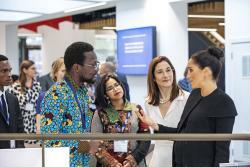 Ephraim, a GP in Uganda who is studying Public Health and Health Promotion at Bangor University’s School of Healthcare Sciences, was invited to meet the Duchess of Sussex at an Association of Commonwealth Universities event to announce the Duchess becoming the Association’s Royal Patron. Ephraim says: I was invited to the event and considered whether I should attend- it was only two days before that we were informed that the Duchess was to be there. I was a little nervous before hand, but discussing my work with the Chair of the Commonwealth Association of Universities calmed my nerves. I was introduced to the Duchess briefly and she asked about my research, she came across as a most humble individual, and was smiling and attentive. She later came back to me for a more in depth conversation about the problems faced by menstruating women in refugee camps in Uganda. Ephraim said that the Duchess was very well informed about African affairs and also about the problems faced by menstruating women in India. Explaining his dissertation subject, Ephraim said that Uganda has the largest number of refugees of any African country and that menstruation is a hidden health issue for women there. His dissertation on the topic has grown from his interest in menstruation and women’s health as an issue in Uganda. The visit has brought a great deal of media attention to Ephraim’s work and he has been contacted by friend and colleagues around the globe who have seen the media coverage. Having been practicing as a GP for two years, Ephraim had decided that the time was right to develop his experience and to extend his education. Ephraim was involved in the first world campaign on menstrual hygiene management in 2014 while he was a medical student. He and a group of fellow young professionals contribute from their monthly salaries to fund visits to rural areas with no access to healthcare, to provide free healthcare services to the people in the hardest to reach areas through a local based organisation called Nyalojjie Integrated Foundation (NIF). Dr Kisangala was nominated for his Scholarship by the Windle Trust International, a charity that promotes education among people affected by conflicts and refugees.